The Sharp R658SLM is a 800w, 20 litre grill microwave, with a 1000 watt grill and 6 different power levels. Looking for an inexpensive yet reliable grill microwave? Sharp have recently introduced the R658SLM, a 800w microwave complete with 1000w grill, which should appeal to many users. The grill element is located in the rear of the roof - meaning that as the turntable rotates, the food gets even and equal coverage. This 1000w grill is located behind a glass shield for easy cleaning, and Sharp supply a metal stand to place the food higher and thus closer to the grill element. Overall the design, look and feel of this microwave are good - finished in a neutral black, silver and grey exterior, with well labelled controls situated to the right hand side of the door. People who dislike operating microwaves with icons will like this model - virtually every button is clearly marked as to it's exact function. There are 6 different preset options, and the microwave itself is pretty quiet during use. The stainless steel interior both looks smart, and is very easy to wipe clean for easy maintenance. The blue LED display is slightly unusual, but is clear, and works well - none of our testers had any complaints about this aspect of the microwave. As mentioned before, overall capacity is 20 litres, and so extra large plates might not fit, but it should cater for the majority of dishes. Build quality is pretty good, and we can't foresee any reliability issues based upon our testing period. 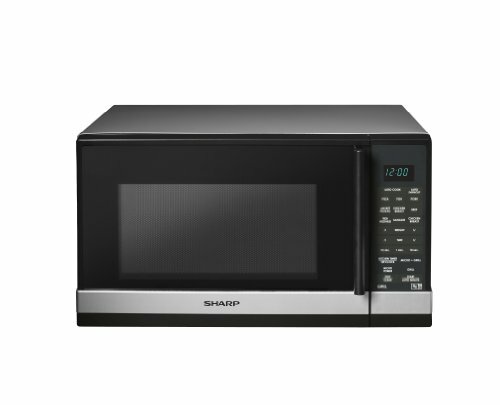 A decent entry level grill microwave, with decent build quality, and good overall performance.